Community Foodworks is committed to partnering with local, family farms to bring you a taste of the region. Get to know the farmers who make the Market Share possible. The Pleitez family farms on 80 acres of land across Westmoreland and King George counties in the Northern Neck region of Virginia. They have over 25 years of farming experience and have been attending farmers markets in the area since 2002, with a focus on growing from non-GMO seeds and using sustainable methods of integrated pest management for the wide variety of vegetables that they grow. Matt and Mary Harsh have been operating 78 Acres in Smithsburg, Maryland (formerly Chesley Vegetable Farms) and attending area farmers markets since 1998. They now farm on over 100 acres of land, growing a stunning array of fruits and vegetables, including several varieties of berries, cherries, peaches, plums, grapes, apples, and pears. Ben Wenk is the seventh generation of his family to take over farm operations at Three Springs Fruit Farm in Adams County, Pennsylvania, which has been in business since 1901. Three Springs farms on over 300 acres of land mostly dedicated to apples, peaches, and cherries, while also offering a selection of berries, treefruit, and diversified veggies at their farm stand. You can join the Wednesday Market Share at any point during the season, which is May 22 - October 9. You will only be charged for the weeks that you participate! There are no fees for starting late or cancelling early, if needed. There are no large upfront payments with the Market Share. When you sign up, you’ll be prompted to enter a credit card for payment. This card will be charged once per week based on your participation. When you schedule a week off, what we call “SKIPS,” you will not be charged! Your Share will be packed and ready for you to pick up between 4:30-7PM at the Columbia Heights Farmers Market. New in 2019! Sign up to pick up your bag at COLONY CLUB, our partner for evening pick ups. If you prefer to pick up your Market Share from 6:30-9:00PM, please choose the Colony Club sign up option at check out. You are welcome to skip any time that you need. In order to do so, and to ensure you are not charged, please email csa@cfwdc.org no later than Sunday of that week to suspend your account. Advance notice is fine as well. You are eligible for 4 free skips throughout the season, and any additional holds will cost $5. You will be charged a one-time $5 fee for your burlap bag when you sign-up. This is non-refundable. Please *! * remember to bring back the burlap bag each week when you pick up your share! This helps save resources so we can provide more fresh food and purchase fewer bags throughout the season. It is our general policy that same-day cancellation or no-show will be charged full price. You'll receive an email by Tuesday with the contents of each week's bag. Plus, recipes, storage tips, and progress reports of our impact throughout the season. Please let us know if you'd like to add any additional email addresses to the newsletter list, we're happy to include your friends and housemates. You can add items like eggs, beef, goats cheese, sausage, and chicken to your Market Share. You can sign up for add-ons independent of a produce Share. YES - get a discount on your recurring protein purchases, and choose whatever produce you like from the market. Did you know that the Market Share offers discounted memberships for residents who rely on Federal food benefits, like SNAP (aka Food Stamps) and WIC (Women, Infants, and Children Benefits). We also deliver Shares to childcare facilities, clinics, senior residences, and other community institutions where folks experience limited access to fresh, affordable produce. ALL the revenue from the Market Share is recycled back into the program to make our Shares affordable. When you choose a SOCIAL IMPACT SHARE, you’re helping that much more to provide essential subsidies on fresh produce to fellow customers who need support. 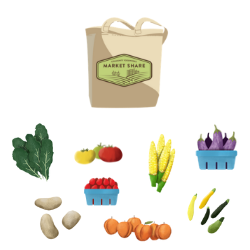 The Social Impact option adds a $3 donation to your weekly Market Share bag, and help ensure that all of us in the neighborhood who are excited about fresh, local produce have the access we deserve.